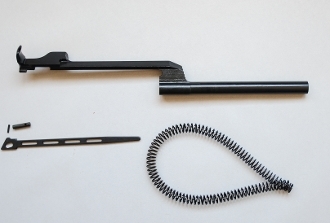 Includes a USGI Winchester operating rod, USGI connector lock and pin, USGI spring guide and a TreelineM14 chrome silicon alloy operating spring. All the USGI parts are excellent, reparked. The op rod has been retabbed. There are options to add a USGI op rod guide and pin, or swap the USGI spring guide for a Sadlak NM spring guide.